Heat the oven to 375°F. Stir the soup, pesto, anchovy paste and tomato paste in a medium bowl. Let stand for 2 minutes. Place the pizza crusts onto 2 baking sheets. Spread half the soup mixture on each crust to within 1/2-inch of the edge. Top with the tomatoes. Season the tomatoes with salt and black pepper. Sprinkle with the goat cheese. Bake for 10 minutes or until the pizza is hot and the cheese is melted. 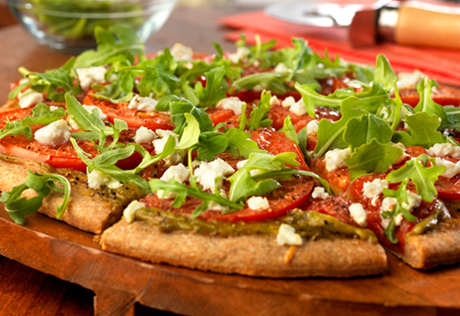 Top each pizza with 1 cup arugula. Flavor Variations: You can substitute black olive paste for the pesto, tomato paste and anchovy paste. Try adding additional vegetables like zucchini, spinach, red peppers or eggplant before baking.